The Internet Safety Technical Task Force (ISTTF), which was formed a year ago to study online safety concerns and technologies, today issued its final report to the U.S. Attorneys General who authorized its creation. It was a great honor for me to serve as a member of the ISTTF and I believe this Task Force and its report represent a major step forward in the discussion about online child safety in this country. The ISTTF was very ably chaired by John Palfrey, co-director of Harvard University's Berkman Center for Internet & Society, and I just want to express my profound thanks here to John and his team at Harvard for doing a great job herding cats and overseeing a very challenging process. I encourage everyone to examine the full ISTTF report and all the submissions, presentations, and academic literature that we collected. [It's all here.] It was a comprehensive undertaking that left no stone unturned. Importantly, the ISTTF convened (1) a Research Advisory Board (RAB),which brought together some of the best and brightest academic researchers in the field of child safety and child development and (2) a Technical Advisory Board (TAB), which included some of America's leading technologists, who reviewed child safety technologies submitted to the ISTTF. I strongly recommend you closely examine the RAB literature review and TAB assessment of technologies because those reports provide very detailed assessments of the issues. They both represent amazing achievements in their respective arenas. The Task Force remains optimistic about the development of technologies to enhance protections for minors online and to support institutions and individuals involved in protecting minors, but cautions against overreliance on technology in isolation or on a single technological approach. Technology can play a helpful role, but there is no one technological solution or specific combination of technological solutions to the problem of online safety for minors. Instead, a combination of technologies, in concert with parental oversight, education, social services, law enforcement, and sound policies by social network sites and service providers may assist in addressing specific problems that minors face online. All stakeholders must continue to work in a cooperative and collaborative manner, sharing information and ideas to achieve the common goal of making the Internet as safe as possible for minors. In sum, education and empowerment are the real keys to keeping kids safer online. We all need to work harder to mentor our children and help them develop the skills and good old fashion common sense to make smart decisions online. Technical tools can supplement -- but can never supplant -- education, parental guidance, and better mentoring. Still, this was a task force that primarily came about after state attorneys general (AGs) had been incessantly pressuring social networking sites like MySpace and Facebook to adopt age verification technologies as a solution to online child safety concerns. Specifically, fears about online predators -- driven largely by the moral panic whipped up by shows like NBC's "To Catch a Predator" -- prompted calls for mandatory age verification for social networking sites. So, what did the final ISTTF report have to say about mandatory age verification. Answer: Probably not as much as the AGs were hoping for, and what we did say they may not like to hear. First, the ISTTF's Research Advisory Board conclusively proved the primary online safety issue today is peer-on-peer cyber-harassment, not adult predation. Mandatory age verification would do nothing to stop cyberbullying. Indeed, the lack of adult supervision may even exacerbate the problem. Age verification and identity authentication technologies are appealing in concept but challenged in terms of effectiveness. Any system that relies on remote verification of information has potential for inaccuracies. For example, on the user side, it is never certain that the person attempting to verify an identity is using their own actual identity or someone else's. Any system that relies on public records has a better likelihood of accurately verifying an adult than a minor due to extant records. Any system that focuses on third-party in-person verification would require significant political backing and social acceptance. Additionally, any central repository of this type of personal information would raise significant privacy concerns and security issues. The Task Force does not believe that the Attorneys General should endorse any one technology or set of technologies to protect minors online. Instead, the Attorneys General should continue to work collaboratively with all stakeholders in pursuing a multifaceted approach to enhance safety for minors online. [Age verification] approaches are less effective in the child safety context -- in other words, at creating safe environments for minors -- than in the context of completing financial transactions or regulating purchases, especially to the extent that identity authentication and age verification focus solely upon adults. The reasons for this include the fact that in the commercial and financial contexts, an adult typically wants to verify his or her identity correctly in order to purchase a product or get access to records. Moreover, when adults purchase regulated items (such as alcohol or tobacco) online, in some cases a second form of age verification occurs when the item is delivered. The identity authentication and age verification solutions that authenticate or verify only adults could be and are already sometimes used to reduce minors' access to adult-only sites. Because they do not authenticate or verify minors, however, they cannot be used to create environments for minors that require authentication or verification prior to access. To the extent that an adult nonetheless uses his or her own verifiable information when accessing an environment intended only for minors, these technologies could enhance the ability of Internet service providers and social network sites to exclude that adult. Of course, it seems unlikely that an adult with nefarious purposes would proceed in this manner. Thus, while these types of identity authentication and age verification technologies may be helpful for other purposes, they do not appear to offer substantial help in protecting minors from sexual solicitation. And there's far more detail following this passage from the final report, so please read that section for additional discussion. It Won't Work: Mandatory age verification will not work as billed. It will fail miserably and create more problems than it will solve. It Will Create a False Sense of Security: Because it will fail, mandatory age verification will create a false sense of security for parents and kids alike. It will lead them to believe they are entering "safe spaces" simply because someone has said users are "verified." It Is Not a Background Check: Moreover, even if age verification did work as billed, it is important to realize it is not synonymous with a complete background check. In other words, even if the verification process gets the age part of the process right, that tells us little else about the person being verified. It Is a Grave Threat to Privacy: Mandatory age verification is dangerous because it would require that even more personal information (about kids, no less) be put online at a time when identity theft and privacy violations continue to be a major concern. It Will Seriously Misallocate Resources: Devising and enforcing age verification regulations might also divert valuable time and resources that could be better used to focus on education and awareness-building efforts, especially K-12 online safety and media literacy education. Moreover, it might divert law enforcement energy and resources away from policing serious crimes or more legitimate threats to children. 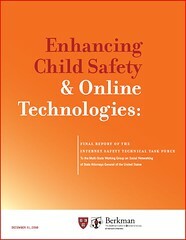 Again, although the Task Force didn't go quite as far as I would have liked in terms of making clear the dangers associated with mandatory age verification, I think our final report reflects the general skepticism among Task Force members about taking that path or relying too heavily on any single, silver-bullet technical approach to online child safety concerns. Again, this is real progress; a sensible step forward in the discussion about keeping our kids safe online. I hope policymakers will take a close look at our conclusions and recommendations and take them seriously. We need to stop wasting so much time searching for silver bullets and start getting more serious about how to better mentor our kids so that they can be good -- and safe -- digital citizens. Education, not regulation, is the key. Below I have linked to some background essays about the Internet Safety Technical Task Force as well as additional thoughts by fellow task force members or reporters. I'll add to it as I see new things in coming days. ISTTF member Anne Collier of Net Family News: "Key Crossroads for Net Safety"
ISTTF member John Morris of CDT: "Deconstructing Reaction to Net Safety Task Force Report"
AGs respond to report in interview with Emily Steel of the Wall Street Journal: "The Case for Age Verification"
a New York Times article by Brad Stone: "Report Calls Online Threats to Children Overblown"
a Wall Street Journal article by Emily Steel: "No Easy Answer for Protecting Kids Online"
an Associated Press story by Anick Jesdanun: "Panel: Technology Alone Can't Protect Kids Online"
an essay of mine from the ISTTF's mid-point: "Age Verification Debate Continues; Schools Now at Center of Discussion"
my book: "Parental Controls and Online Child Protection: A Survey of Tools and Methods"